I have made a 8 x 24 led matrix using shift registers and I want to increase the columns that is 24 x 24. Can I do it using shift registers or is there any limitation in expanding rows? 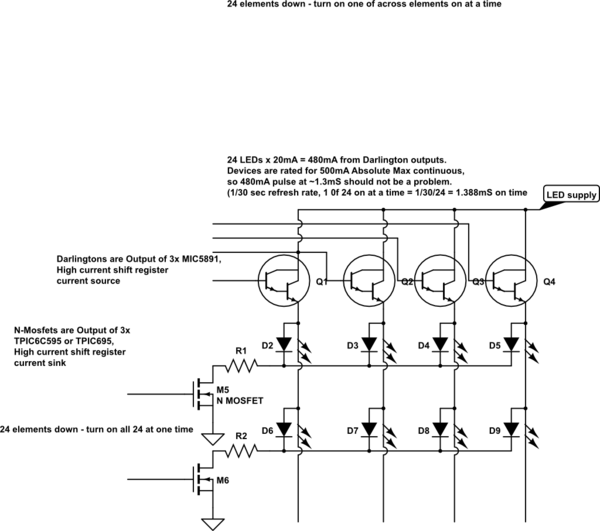 You can keep chaining shift registers together for quite some time before you hit any practical electrical limitations. The problem you’ll run into much quicker is wiring them all together. It’s an awful lot of jumpers to have flying around. I had a project with 3 chained together. It wasn’t too awful on the breadboard, but soldering the photo board was a complete nightmare. You can definitely get away with shift registers, but at 24x24, I would be considering looking at prebuilt led matrix displays, like this one from Adafruit. If you’re really determined to build this yourself, consider multiplexing the display with a driver IC. Maybe something like this, but possibly more channels. So your array could be set up like this. Current source driving one column at a time, current sinks turning on the requested LEDs for that column. Alternate method would be current sources driving the requested LEDs for a row while a current sink drives all LEDs in that row. What is the Arduino Nano maximum wattage?